Touching story about three sisters and a granddaughter who overcome misunderstandings stemming from childhood. The oldest missed having a relationship with her father who abandoned her. The other two lived in a household with a socialite abusive mother, and father (of the oldest sibling) who couldn’t accept his first daughter, and wouldn’t stand up to his socialite wife, thus missing out on relationships with his other two younger daughters. Through the years it was the paternal grandmother and her mate who supplied love, support and guidance to the three girls and granddaughter. But each of the girls held secrets oft their own as they got older,feeling shame and embarrassment which they were too ashamed to share with their grandmother and her mate. It took the death of their grandmother to bring them all together once again and to learn the biggest secret of them all. This is a heartwarming story about forgiveness, understanding, compassion, and finding love in each of their own lives. Heartwarming, homespun, quirky, emotional and entertaining adventure for three sisters with a lot of real life regrets and secrets keeping them apart. Dana, Harper, and Tawny are the “Sometimes Sisters” each with a different yet sad history and only one summer together at their Granny Annie’s lakeside resort (their dad’s mom). When Granny Annie passes it is her dying wish they come together to run the resort and make a go of it as a family. Uncle Zed is on hand to help them become the sisters they are meant to be. (Granny’s best friend) I just adored him so much. This story made me cry, laugh and sigh almost at the same time. Just loved it! 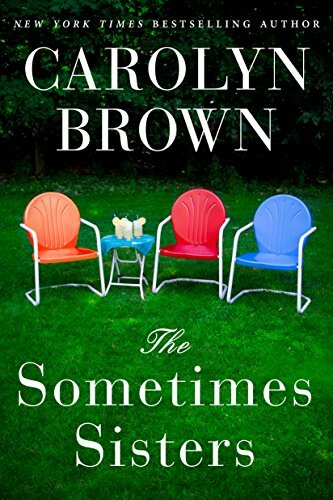 5+ Stars Enjoyable Carolyn Brown is a must buy, must read author. This stand-alone is easy to follow, difficult to put down and filled with emotion. There is no violence or drag-you-down drama. Realistic storyline with descriptive writing. Believable characters with distinct personalities. Thought-provoking dialogue. I will re-read this story and always look forward to works by this author.